Unlimited sending available. Dedicated IPs are available for any plan at $30 month. Click here for a custom quote. We also offer a Free For Life plan and a 25% discount for non-profit organizations. Benchmark is trusted by thousands of businesses just like yours. What are the three different plans? These plans are based on the number of emails you plan to send per month. These are great plans when you only send out 1 or 2 email campaigns per month, like a newsletter or bi-monthly coupon, etc. If you have a small list, our Plan 600 is a great place to start. These plans are based on the number of users on your contact list(s). With these plans you can send multiple email campaigns to your entire list, up to seven times per month. Uploaded contacts are limited to the size of the plan (for example, a List Plan 1K can upload a total of 1,000 contacts). These plans are for users who need to send more than 100,000 emails per month. Because large senders can be flagged as spam without the proper procedures, we take these plans very seriously and ensure the utmost care is taken with High Volume (also known as Dedicated Server) Plans. A dedicated IP is your own special internet address that only you use to send emails. This insures that only you affect your own reputation. In most situations, clients use a shared IP with many other clients, sometimes even hundreds sharing the same IP. With this dedicated option you can remove yourself from the crowd, thereby insuring your best reputation and getting into the inbox. These options are available for $30 per month. Simply tell your sales representative that you would like this option enabled in your account. 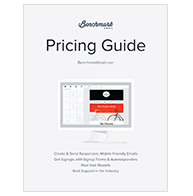 Benchmark Email offers both monthly and annual plans. After your initial subscription fee, you may cancel your account at any time. Though we will regret to see you go, if you must cancel your account, please do so before your monthly or annual renewal date or you will be charged your next month’s/year's subscription fee. Benchmark Email will not prorate or refund our service if you fail to cancel your account prior to your renewal fee.